2. When both freshwater and saltwater angelfish species are counted there are more than one hundred varieties of these fish available. The freshwater variety will not usually get bigger than a few inches, but they can add a lot of beauty and tranquility to any home or office tank. 3. All species of freshwater angelfish originated from one area on earth, and this is the Amazon River. The natural habitat for these fish is only found along this river and in the streams and lakes that the Amazon runs into in South America. Most of the fish sold in pet stores are bred in captivity, and have never experienced the wild. 4. Buying angelfish for sale is a commitment, because these fish may live up to ten or fifteen years and will need to be cared for during this time. The color variations you will find can be astonishing, with names like black marble, gold marble, and others. While these pets may not be more than six inches tall they can add a lot to your aquarium. 5. Some people believe that freshwater angelfish are highly intelligent, and there have been cases where these fish recognize their owner and respond. In the wild the fish prefer flooded swamps and forests, but in captivity they will usually get along with most other aquarium species. 6. Female angelfish may lay eggs on the fish tank decorations in your aquarium, as well as on rocks and the bottom of the tank. The eggs will take between twenty four and thirty six hours, and the female can lay up to one thousand eggs at one time. 7. 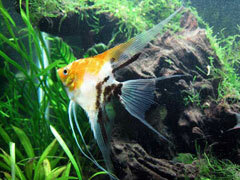 Freshwater angelfish are carnivorous, and will eat smaller fish as well as insects and other small prey. A diet of live, frozen, and fresh foods are recommended to ensure that your pet gets the proper nutrition needed.